Another view of the sloop Margret Todd. End of a day of rain, with the storm just breaking on the horizon behind the islands of Bar Harbor. 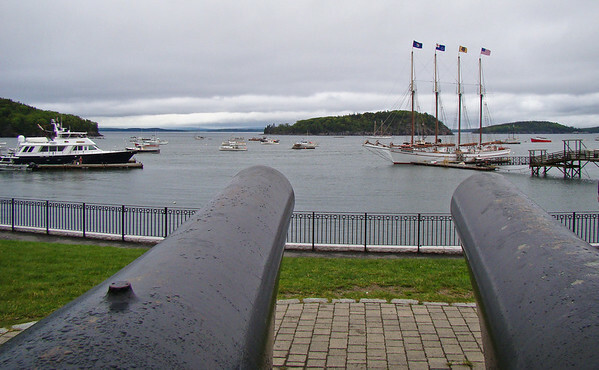 The guns are in the park above the Harbor. I had to crop out the guy who walked into the right side of the frame (I did not have time to take another shot as my family was rapidly disappearing around the first bend in the Shore Path), but in the end I think it actually improved composition. Recovery in Lightroom for the sky. Added Clarity and Vibrance (though in the subdued light it barely matters), and Landscape sharpen preset. From Mount Desert Island/Bar Harbor 2009.